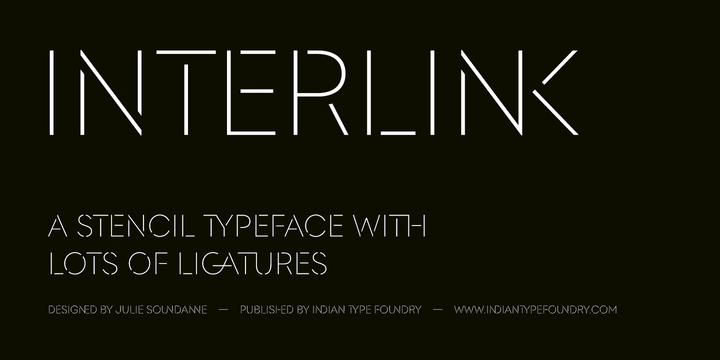 Interlink is a stencil font created by Julie Soudanne and published by Indian Type Foundry which you can discover different types of ligature constructions. Round shapes are nearly circular, stencil shapes is diagonal and it has angled terminal and no contrast. It works great in display sizes. Also is ideal for headline, logo, magazine. Have fun! Price: one font for only $50. A font description published on Wednesday, May 30th, 2018 in Fonts, Indian Type Foundry, Julie Soudanne by Alexandra that has 1,705 views.